Mother Wins Back Son Unjustly Detained by LA County’s DCFS! In a ruling today, Good Friday, at Edelman Children’s Court, a judge ruled that the son of Mrs. Patty Sanchez, a low-income Spanish-speaking mother, be returned to her. This brings a happy conclusion to an 18 month separation of mother and son. DCFS detained Mrs. Sanchez’s son in September 2011 when she was falsely charged with medical neglect of her then 15 year old special needs son. Mrs. Sanchez along with community supporters from Every Mother is a Working Mother Network and DCFS-Give Us Back our Children, fought tirelessly for the past 18 months for her son to be returned to her. Today, Friday March 29th, the Children’s Court judge ruled that placement in foster care be terminated and for services to the family to be continued. He also ruled that her son will continue to be under the “custody” of the court until a hearing on October 4th. Until that time, family will continue to be monitored by a DCFS social worker. Mrs. Sanchez had tears of joy at the ruling, there were hugs and smiles all around as she greeted family and supporters. She says “I am overjoyed I now have my son home with his family who missed him and who loves him. Who can care better for him than his mother?” His little sister Ruby was all smiles and Mrs. Sanchez’s son seemed at ease with his family. Her supporters say that in addition to reuniting mother and son that DCFS has to be accountable for this injustice, and offer the necessary support for the family including healing their emotional trauma. They say what happened in this case should be investigated so that no other family has to go through what the Sanchez family has. They say that rather than providing the resources to keep the family together instead DCFS took the son from his mother’s loving care and placed him in foster care with strangers. Nevertheless, despite concerns of how and why this happened, all involved are thrilled that the family is finally, after a long haul, back together again and just in time for Easter! SoCal Action Alert: Two DCFS cases in court Friday March 29th! Action Alert! Your support needed! Supporters are needed at both locations! Let us know which location you are able to go to. 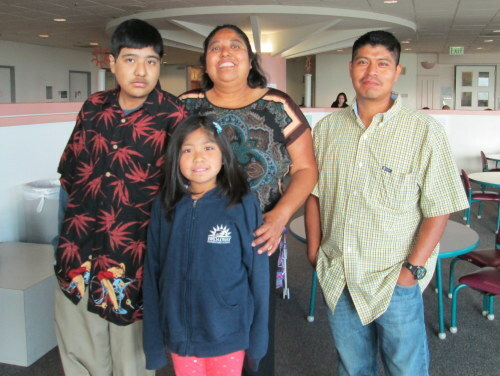 Support Reunification of Patricia Sanchez with her son! Meet outside Edelman Children’s Court 8:30am 201 Center Plaza Drive, Monterey Park, CA 91754, Dept 412. Patty Sanchez has fought long and hard to be reunited with her son who was detained by the LA Department of Children and Family Services (DCFS) since Sept 27, 2011. Patty Sanchez, a Spanish speaking mother of three had been falsely accused by DCFS of severe neglect of her special needs 16 year old son. But all who know Patty say she is a great and caring mom! Her son has been diagnosed with multiple medical problems, which have proved difficult for doctors to diagnose and treat. Patty has met all the requirements mandated by the court as conditions of reunification and her son never should have been taken from his loving mom. We are hoping that on Friday Mrs. Sanchez and her son will be reunited! Join us to show your support for the Sanchez family! Support May Hampton’s right to raise her grandchildren! Meet outside CA Superior Court 9:30am 300 East Walnut Street, Pasadena, CA 91101, Rm # North East A. May is a loving grandmother who has been raising her grandchildren but now has to fight to be able to continue to care for them after false and unsubstantiated charges of abuse were filed against her. May lives for her grandchildren, she sacrifices her own needs for them and not only is she doing the work of raising them on few resources but she finds the time, the energy, the heart to help others. May is a loving, caring grandmother who has devoted her life to the well being of her grandchildren, and your presence and support for her is needed at this trying and terrible time. Join us to support this grandmother’s right to continue to raise her grandchildren! Endorsed by: Alexandria House; KidVillage@OccupyLA; Global Women’s Strike/LA; Womenscircle@occupyLA; Women of Color/Global Women’s Strike. Contact us to let us know which court you can go to on Friday morning! ON SATURDAY, MARCH 9, 2013 AT 10:30 A.M. The beginning of a beautiful day, the weather was perfect. We gathered for a rally at the Downtown Jail, across the street from us family members were lining up to visit their loved ones, they were someone’s mother, sister or daughter. We were able to speak with some of them and they were happy to see us out there rallying for justice for themselves, their loved ones and for all women around the world. Lots of people signed our sign in sheets that wanted to join us in future events, passersby were honking horns and waving in support. Even though we were across the street from the jail, likely some of those inside could see us through the tiny windows and were perhaps encouraged that we were outside protesting, that we were in solidarity with them, it was a great feeling! The Aztec Dancers were exciting to see. They opened the rally in a traditional Native American way and then they danced at the front of the march. They were wonderful, everyone was either clapping or doing dance on steps along with them. They wore traditional Aztec clothing as they danced to the beat of the drums. Before the march there was a brief rally. The speakers there included Nancy Berlin of Alexandria House, Mary Sutton No More Jails LA, Ed Garza Military Families Speak Out and Veterans for Peace Orange County, Ruth Sarnoff Women’sCircle@OccupyLA, Art Frias UWUA Local 132, Judith Garcia Aztec Dancers and Patrice Cullors Coalition to End Sheriff Violence. All the speakers at the rally were appreciated and everyone was amazed that the President of the Utility Workers Union of America Mr. Langford sent a heartfelt message to us. The message was read by the President of Local 132! We felt so good that a labor union was out there with us women, with the community. In their statement they recognized the importance of the community and of women in making their victories possible. They were the only labor union represented. It warmed our hearts to hear this message of labor and community solidarity. Our March for Survival was lively, lots of singing, chanting and dancing. We carried banners and posters representing our message of Invest in Life and Welfare, Not War and Prisons. Our message reflected all of the groups that were there, bringing to the attention of the public, our rights and the rights of others who are afraid or unable to speak for themselves. BOOKSTORE in downtown LA about a mile away from jail, where we held a teach in. Those of us that couldn’t walk the distance rode in a van, with banners on each side. At the end of the march was the colorful Kidvillage@occupyLA bus that was decorated with banners outside. Some of the children rode in the bus. They had fun. The bus driver would honk the horn of the bus. We made lots of noise. The majority of the people walked all the way. Being on the march was an awesome feeling of power and achievement. A lot of young people participated from the Youth Justice Coalition, they led chants and some of the young men did some brake dancing. With all of the songs sung and chants and the noise we felt real good. When we marched under a tunnel we got really loud, with the Aztec Dancers drumming and dancing all the way. During the march there were also lots of horns from the cars and trucks passing by. People stopped to watch and cheer us, they took lots of pictures of us. There were some media vans. The closer we got to downtown the numbers of people watching us increased, people were standing on both sides of the sidewalk as we marched and drove down the street. The women especially liked us cause they knew we were honoring women and calling for women’s work to be counted, but a lot of men appreciated us as well. The police (LAPD) escorted the march since the city had not closed off the side of the street like they were supposed to. We had worked hard to get a permit to march on the street. We were excited and it was a high spirited event, it kind of had a nostalgic tone to it which made me know just how important these kinds of events are. At approx: 1:30 we got to the LAST BOOKSTORE downtown, we took a short break to get a little something to eat and drink. The children ate and went to a little area called the children’s circle, with personal supervision, where they can play and have fun, they can read or draw or just rest, have healthy snacks. Then we began our Teach In. The first panel was on Women Surviving Globally and we watched video presentations from or about Haiti, Tanzania, Guyana, and IJAN (International Jewish Anti-Zionist Network). The last clip was of President Hugo Chavez of Venezuela talking about how important women were to what he was trying to do in Venezuela. We were all sad that such a man had died. After the panel some members of the audience asked questions or made brief statements. Sr Judy Vaughan and Nancy Berlin of Alexandria House read a Resolution from LA City Council called Women: Surviving Globally, Surviving in Southern California and everybody got a kick out of getting this support from LA City Council. Our second panel was on Women Surviving Locally and included the following speakers: Diana Zuniga of Californians United for a Responsible Budget (CURB), Tanisha Denard Youth Justice Coalition, Rachel West US Prostitutes Collective, Alexa Rishton Military Families Speak Out, Rosamaria Segura CHIRLA Household Workers Campaign, and Lydia Ponce an Indigenous from Idle No More/LA, and myself DCFS Give Us Back Our Children. The panel represented many different groups who were working on a grassroots level to improve women’s lives, it was amazing how all these struggles were connected. If we don’t support all of us we will all fall, we need each other if we are going to get anywhere, if we are going to win. If we stay separate we are weaker and it is easier for us to get picked off to be used one against the other. There was a lot of high energy during the day. Margaret Prescod gave a call to action that got everybody fired up! The event was a success and the food prepared by Food Not Bombs and some by myself, if I may say so, was really delicious, everybody enjoyed it and ate their heads off. People signed up to work on different struggles and we decided to come together maybe once a month or so to do an action or activity together. I feel it was an eye and mind opening experience for many. We all left feeling more powerful. The event in LA was coordinated by the IWD planning group which included: Alexandria House, Californians United for a Responsible Budget (CURB), Critical Resistance, DCFS Give Us Back Our Children, Every Mother is a Working Mother Network, Iraq Veterans Against the War LA Chapter, KidVillage@OccupyLA, Martin Luther King Coalition, Military Families Speak Out, NO MORE JAILS LA, Veterans For Peace Orange County, Women’sCircle@OccupyLA, Women of Color/Global Women’s Strike and GWS/LA. The global event was called by the Global Women’s Strike in Guyana, Haiti, India, Peru, UK, and US. For more info, contact 323-276-9833, la@allwomencount.net. Doing What’s Right! A Further Victory in Rights of Elder to be Cared for at Home! On February 20th, the words coming from the mouth of the Honorable Judge John D. Herron, of the Court of Common Pleas of Philadelphia, Orphans’ Court Division, was music my ears. I was again appointed co-guardian of my Aunt, Constance C. Clinton, an honor taken away from me by the infamous and corrupt James M. Tyler, the first court-appointed guardian. And to add icing on the cake, the second guardian, Darryl Irwin, was silenced as he attempted to petition the court to force me to pay a debt from the Simpson House, debt created by James Tyler when he locked her in that institution. Read and enjoy! Press release from Congresswoman Gwen Moore’s website. Washington, D.C. – Today, Congresswoman Gwen Moore (WI-4) re-introduced a bill that will take important steps towards ensuring that parents and legal guardians are afforded legal representation in all stages of a child welfare case. There are over 400,000 kids in the foster care system in the United States, many because their parents or guardians are accused of abuse or neglect. Professionals and parents agree that removing a child from his or her family can be traumatic and foster care, in many cases, does a poor job of preparing children for adulthood. For this reason, child welfare law is structured, through federal law incentives, to limit removal of children from their home unless absolutely necessary for the child’s safety, and promotes their reunification with their family. New research powerfully supports these goals by showing that children often have better life outcomes when efforts are directed towards keeping a family together. One of the most fundamental arenas for ensuring the safety, stability and permanence for abused and neglected children is through our nation’s court systems. Recently reauthorized under the Promoting Safe and Stable Families program (IV-B of the Social Security Act), The Court Improvement Program (CIP) has been instrumental in improving child welfare outcomes in state courts. The CIP has helped reduce the caseload delay, and also worked to stimulate fresh approaches to improving the court outcomes of children and their families. “This legislation builds upon the successful framework of the CIP, adding an additional component for parental legal representation,” said Rep. Gwen Moore. “Child outcomes improve and courts function more effectively when all parties have quality legal representation. This legislation gives parents, alongside officials and judges, a voice when the best interests of their child are at stake. The plight of women around the world was the topic of a forum held at the Tabernacle United Church in West Philadelphia on Friday March 8, in honor of International Women’s’ Day. Attendants listened to speakers representing various groups and organizations as they discussed the continuing fight for equality. Documentaries, which detailed various struggles around the world, including Europe, Africa and South America were also presented. While repression and other inequalities were addressed, the case of Carolyn Hill, whose young nieces were removed from her home by the Department of Human Services (DHS) and placed in state care until eventually placed in the custody of relatives, was the topic of a forum held at the event. According to Hill, the children, aged 5 ½-months and 1-year-old, were placed in her custody by relatives who decided she should care for the children in the absence of their parents. Hill, who raised five children of her own and has also cared for other relatives in her home in the past, agreed to do so. According to Hill, initially there was no problem until the agency was changed and another childcare agency assumed review of the case. That was when her troubles began, she said. While it is against the policy of DHS to discuss ongoing cases or to even acknowledge the existence of particular cases, Alicia Taylor, a DHS employee, suggested the agency doesn’t decide whether or not children are removed from a home. This, according to Taylor, is in the hands of judges. In fact, Taylor noted even when there are allegations of abuse or neglect and such cases have been substantiated, DHS still would not have authority to remove a child. “We would have to contact the law department, they go to court and they issue the order for us to remove a child,” she said. Even in such cases when a child is removed from a home, foster care is a last resort, according to Taylor. Taylor would not discuss details about the Hill incident. During the forum, advocate and organizer Celyne Camen, of the group “Every Woman Is A Working Mother Network” spoke about the circumstances of Hill’s case as an example of the need to continue fighting for the equality of mothers. Camen described her group as an organization, which fights for the right of mothers and against welfare reform laws and has taken up Hill’s case after she contacted the group last year. According to Camen, one reason given for the removal of the children from Hill’s home was she did not have a general equivalency diploma (GED). “We found that to be biased. If you are going to do that than you are going to be taking a lot of children out of families,” she said. Camen added she has worked with Hill for quite some time and described Hill as very articulate and a compassionate person. Hill said that she was given no reason why her nieces were removed from her home but a subsequent hearing on the matter was held at family court. She was not allowed to speak during the proceedings. According to Hill, she could only sit and listen as allegations were made against her. During that time, Hill said she has never faced eviction from her home and there were never any allegations of abuse in her case. Hill noted she was in the process of adopting her two nieces when they were removed from her home April of last year. She continues to fight for their return. Women’s groups, in the US and other countries, laud the reintroduction of the RISE Out of Poverty Act in Congress on the occasion of International Women’s Day Week. The RISE Out Of Poverty (RISE) Act was reintroduced in the US Congress Monday, February 25 by Congresswoman Gwen Moore of Wisconsin (http://gwenmoore.house.gov). A former welfare mother herself, Representative Moore, a member of the Congressional Black Caucus, first introduced the bill on December 6, 2011. Grassroots women in several states have formed a national network to gather support for the legislation. They will be highlighting the importance of the bill for ending the poverty of children and their mothers at events to be held on or around International Women’s Day March 8. RISE has also received recognition in the British Parliament with an Early Day Motion put forward by John McDonnell MP. The bill acknowledges the caregiving work that mothers and other carers do, and that such critical work of a society has not been supported or even acknowledged by governments local and national. The result is that the caregiver and those she or he cares for are barely surviving. · Protecting wages and working conditions by entitling mothers to refuse jobs below minimum wage or at work sites on strike or lockout. TANF or welfare “reform” has been devastating and divisive to our families and entire communities: since its passage in 1996, extreme poverty among women-headed households has nearly tripled. 1.46 million households live on less than $2 per person per day. Those of us who are single mothers and our children, already the most impoverished, are the fastest growing population of those going to prison. With no income, with the safety net in shreds, mothers have no choice but to do what we can to feed our children, including taking survival steps which criminalize us. It is no accident that when welfare is cut the number of single mothers arrested for prostitution increases. Mothers have had children removed from their care after being charged with welfare fraud for working as a housecleaner while receiving benefits too low to live on. Others have had to choose between homelessness and returning to an abusive partner; and then if we are a victim of domestic abuse or become homeless, child welfare detains our children and places them in foster care or on a fast track adoption schedule, accusing us of failure to protect our children. In fact, welfare “reform” transferred money from welfare into “child welfare”, and the numbers of children removed from their homes and placed in foster care – especially from families of color – due not to abuse or neglect but to poverty have skyrocketed since its passage. Black children are more likely to be taken from their homes and placed in foster care, to stay in foster care longer and never returned to their families. Contact us for more information, including activities planned on or around March 8, International Women’s Day. Women of Color/Global Women’s Strike, Guyana, UK, US. We’ll rally & speak-out at the downtown jail (Twin Towers & Men’s Central Jail) joining family members, mainly women, waiting to see their loved ones. We will march to The Last Bookstore for a teach in (caravan for those not walking). Join women in SoCal and around the world as we raise our voices and plan our campaigns against poverty, war, the criminalization of survival, prison/jail expansion, deportation, removal of children from their moms due to poverty, lack of resources that tear families apart, and the destruction of our beautiful planet! Your voice, your help is needed. Spread the word! March 9th Women: Surviving Globally, Surviving in Southern California. Please start circulating on your websites and on social media. If you want to help plan this action please contact us (see below). All welcome! Children’s Activities, Music, Food. Southern California Planning Group is coordinating the SoCal action and includes: Alexandria House, Californians United for a Responsible Budget (CURB), Critical Resistance, DCFS Give Us Back Our Children, Every Mother is a Working Mother Network, Iraq Veterans Against the War LA Chapter, KidVillage@OccupyLA, Martin Luther King Coalition, Military Families Speak Out, NO MORE JAILS LA, Veterans for Peace, Women’sCircle@OccupyLA, Women of Color/Global Women’s Strike and GWS/LA. This is a crucial year to recognize and value the work – undervalued, unwaged, and low-waged – of all those, beginning with women worldwide, who make the survival possible of families and communities. Join women in Philadelphia and around the world as we speak out and plan together our campaigns against poverty, war, the criminalization of survival, prison/jail expansion, solitary confinement, deportation, removal of children from their moms due to poverty and lack of resources, that tears families apart, family farmers pushed off the land, and the destruction of our beautiful planet! NOT MILITARY BUDGETS & PRISONS! Endorsed by: Brandywine Peace Community, Radio Against Apartheid on WPEB 88.1 FM. Please contact us if your organization would like to endorse and to help build this event. Thirty of the children’s relatives want them reunited with their Aunt Carolyn Hill. Why isn’t DHS listening to the Hill family, and why is the Support Center for Child Advocates blocking their wishes? Four months have passed since DHS Commissioner Anne Marie Ambrose wrote a letter supporting Ms. Hill as a caregiver for her nieces. Why have they done nothing to reach this result? Why are they causing further trauma to the children and Ms. Hill by cutting their visitation times to two hours a month? It is almost a year now since the children were brutally snatched from Ms. Hill’s home at dinnertime and without notice. They have been in the homes of strangers and now they are in childcare 10 hours a day. Ms. Hill is ready and willing to give these young girls her full-time attention and her full-time love. Isn’t it in the best interest of the young girls and the Hill family to return the nieces to their Aunt Carolyn Hill right away? To understand the unjustice that is being done to the Hill family and many other families in Philadelphia and the nation, read an interview with Carolyn Hill this Wednesday (March 6) in the Philadelphia Tribune, listen to her on G-town radio’s For the People call-in show Tuesday night (March 5) 8-9:30pm at www.gtownradio.com, 215-609-4301 or Facebook/Twitter your comments, and come out to the International Women’s Day Event at Tabernacle Church in West Philly this Friday (March 8) from 5-8pm to hear her and Hill family members speak out. Call, email or fax them this moment to register your support for Ms. Hill and her nieces and to tell the commisioner and the mayor to reunite Carolyn Hill and her nieces now!